Leisure structures range in size from relatively small buildings, such as gymnasia, to larger buildings such as stadia which may be capable of holding 80,000 people. Each project comes with its own challenges, opportunities and efficient structural solution. They have unique requirements within the construction sector, as most modern developments are now multi-functional and have an inherent requirement to be state-of-the-art and distinctive. Unlike other types of more generic buildings, leisure structures tend to be quite specialist and architecturally-driven with particular emphasis given to quality, function, flexibility and appearance. There is increasingly a focus on high levels of operational energy efficiency and use of renewable energy technologies in the leisure sector. This article addresses construction related issues associated with leisure buildings and particularly their structural forms and requirements. Several types of leisure buildings share many features with other buildings, such as single-storey buildings, educational buildings, etc. The attributes of steel construction are well adapted for leisure facilities and are routinely used to optimise the design. 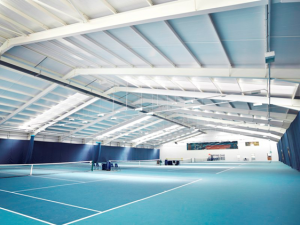 This is primarily because it offers a cost-effective solution for bespoke, architecturally-driven solutions such as stadia, as well as cost effective generic designs such as portal-framed sports halls. In addition, steel is a versatile and sustainable material which has an aesthetic appeal at both large and at small/detail-scale. It offers flexibility which can be very important for projects that are constrained by site or planning restrictions, or for venues which may wish to add to or reduce their overall capacity in the future, for example, grandstands for stadia hosting major sporting events. All sports stadia use steel construction as part of the functional and architectural solution. The construction of new leisure facilities and the refurbishment of older venues tend to be relatively large-scale projects, which require major up-front investment. The project time-scales are usually quite long including planning, design and construction stages. In this context, an early return on investment is particularly important for leisure companies, local authorities and sports bodies and therefore speed of construction is vital. With many sports having a ‘closed’ part of the season or year, or important immovable annual events, speed of construction is often critical. The speed with which primary steel frames can be constructed and clad, allowing early commencement of the installation of services, has an important effect on the overall cost of the project. 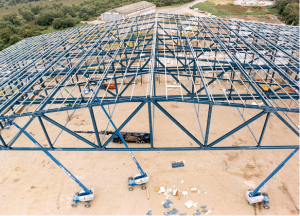 Large components such as trusses, can be assembled on the ground before being craned into position. Leisure buildings usually need large column-free spaces for pitches, courts, swimming pools, etc. and to provide unimpeded views for spectators in stadia and arenas. Steel offers the best and most cost effective method of achieving these requirements, for example through truss arrangements or steel girders. In this context, one of the key features of most leisure buildings is a large-spanning roof or structural system. All modern stadia use some sort of long-span steel construction and many architecturally-driven solutions are possible only using steel. As an example, the London Olympic Aquatic Centre was designed such that the roof covers an area of 11,000m2 with a column-free space of 160m in length and up to 90m in width. It comprises long span trusses over the main pool hall which are arranged like a fan to create the complex geometry required. The roof is supported at only three points and cantilevers 30m beyond the supports, thereby creating an architectural feature. The Aquatic Centre was the iconic building of the London 2012 Olympic Games. Other examples include Wembley Stadium (below left) and the St. George’s Park National Football Centre at Burton Upon Trent (below right), which was completed in 2012 and features 80m wide spans of column free space in order to enclose a full-sized synthetic football pitch. This is created through a framed solution with 4.5m deep trusses, fabricated from perimeter columns and circular hollow sections in triangular form. In addition to providing an economically and structurally efficient solution, steel construction allows designers to deliver aesthetically appealing buildings, offering clean lines, slender elements and a contemporary appearance. It offers an excellent strength-to-weight ratio meaning that less material is required in comparison to other materials. Architectural design often makes use of the appearance of exposed steelwork and utilises the voids created by space trusses, for example, to avoid having prominent ductwork and services on display. One of the main advantages of steel in leisure building design is its capability to span long distances without the need for intermediate supports. This means that large unobstructed space can be created, which are necessary for swimming pools, gymnasia and pitches/courts as well as indoor and outdoor stadia. Spaces can also be created beneath the roof structure, which can be utilised for other revenue-earning activities. Leisure buildings are often bespoke and unusual structures which require the flexible and adaptable use of steel to meet some challenging requirements. A key challenge in the construction of the Aquatic Centre for the London 2012 Olympics was the wave-form roof, where the lower surface dips between the diving and competition pools and the two sides sweep upwards, providing column-free sightlines for all 17,500 spectators to the far-side lane of the competition pool. By using steel trusses in a radial arrangement, which cantilever over the supports, the desired effect was achieved. Many of the temporary London 2012 Olympic venues and grandstand structures for the permanent venues, will be disassembled and moved now that the games are over. 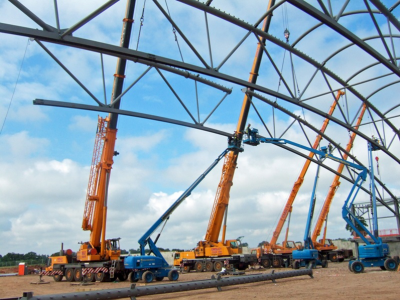 In this context, one of the key advantages to steel construction is that it is easy to design connections and members such that they can be dismantled and reassembled again, so a structure can be broken down into smaller elements for transportation and re-erected in an another location. 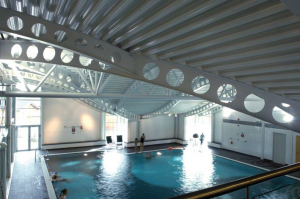 The leisure buildings covered in this article are large in scale and therefore the use of high quality protection systems with a long life expectancy is important to clients in order to reduce long-term maintenance costs. To this end, the guarantees provided by steel suppliers together with useful maintenance advice mean that steel is the ideal choice of material. Application of steel in exposed locations and corrosive environments (for example swimming pools) requires careful selection of the corrosion protection system in order to reduce the long-term maintenance. The high strength-to-weight ratio of steel is a significant advantage in the construction of leisure buildings, as it can result in material and cost savings. In addition, a lighter super-structure may result in low foundation costs which can be a particular advantage when the ground conditions are poor. Even within the various steel solutions available, it is worthwhile to engage in a value engineering exercise before finalising the design, taking account of installation, maintenance and subsequent dismantling. The example shows how a combination of trusses and cellular beams are used to provide an economic solution in a university sports centre. Steel is a sustainable material in that it is multi-cyclable. Steel construction is adaptable, reusable, and offers a zero-waste solution. Leisure structures often comprise bespoke designs with significant associated costs. Savings, both in terms of material resources and cost, are achieved through lightweight structural steel solutions. In recent years, clients in the sports and leisure sector have recognised that high-quality design is good business. In this context, the importance of having a modern, well-designed and user-friendly stadium, sports hall or auditorium is very important to the revenues that can be achieved either through membership, attendance at sporting events or through supplementary events such as corporate hospitality, conferences, etc. In addition, some leisure buildings, such as swimming pools, gymnasia and, to a lesser extent, theatres, are high-energy users and hence there has been an emphasis within the sector on using energy efficient design and renewable energy technologies. Structures in each category can vary in scale from small, with a capacity of a few hundred, to very large stadia with a capacity of 80,000+ spectators. 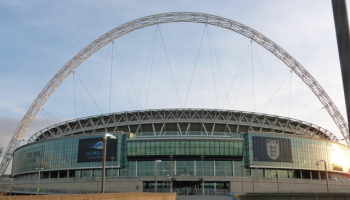 Sports stadia are valued as an integral part of the urban and social environment in the UK as they offer local commercial and employment opportunities as well as venues for many thousands of people to socialise and enjoy sport and use the same facility for other social functions. All over the UK, there are highly visible, iconic designs which have a positive and inspirational effect beyond just that of the fans. 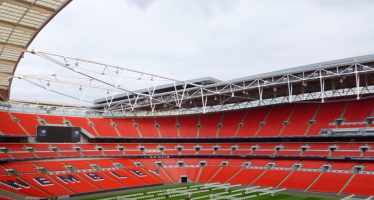 In fact, over 50 new stadia have been constructed in the UK in the last 25 years, in addition to the many older venues that have been refurbished. Steel is, by some margin, the most common material used to construct stadia as a result of its engineering, aesthetic, economic and environmental attributes. Stadium design is often governed by unique criteria such as local access routes, health and safety (including fire safety), as well as aesthetic and community considerations which are relevant to local residents. In addition, one of the hallmarks of a modern stadium is its capacity to operate as a multi-purpose venue offering, for example, conference facilities, the ability to host concerts, restaurants and retail outlets, etc. in addition to traditional sports events. In this respect, the flexibility offered by steel-framed solutions is clearly ideal for sports stadia. As well as being aesthetically pleasing, construction can usually take place with minimum disruption owing to short on-site construction periods and much of the fabrication and supply of specialist equipment being carried out off-site. For example, modular units can be used for kiosks and highly serviced areas. This category includes leisure centres, sports halls, swimming pools and gymnasia which may also require spectator areas. Typically, long span construction dominates this sector due to the requirement for large volumes of uninterrupted space and in this respect, steel offers the perfect solution. Energy efficiency is particularly important for indoor sports venues such as swimming pools, gymnasia, etc. as these have high heating, lighting and ventilation demands. The key aspects of the design of leisure centres are flexibility of the space, acoustics, local transportation and parking, energy efficiency and sustainability criteria as well as building services solutions. Theatres and auditoria are generally smaller in capacity than the other categories covered in this article. However, the main design criteria remain unchanged: that is the requirement for long spans and uninterrupted space. Experience has shown that lightweight, easy-to-construct steel frames result in shorter construction periods as well as lower foundations costs. Given that the theatre and entertainment industry is very important to both society and the national economy, as dedicated theatre districts such as the West End in London help drive the national tourism sector, speed of construction is vital as is being able to deliver projects within tight urban sites cost effectively. Leisure buildings are usually set apart from other types of structures by the requirement to provide large open areas, either indoor or outdoor, which are not obstructed by columns or other intermediary elements. Moreover, leisure venues tend to be architecturally-driven with a focus on design and appearance. Steel is the most common material for buildings in this sector as it offers lightweight solutions together with the ability to create large un-interrupted spaces cost effectively. Traditionally, stadia have been rectangular in plan with up to four individual stands which were maybe designed as stand-alone structures. Newer stadium designs usually adopt a holistic approach and design the whole stadium as one to give a circular, oval or rectangular shape in plan. This typically involves complex structural solutions involving large trusses, cellular beams or pre-stressed cable systems. 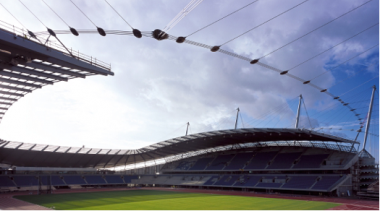 The critical feature in most modern stadia tends to be the roof which can be supported using traditional truss systems, a mast and cable solution or through three-dimensional cable net solutions. On the other hand, for most indoor leisure buildings the typical arrangement includes a relatively lightweight frame clad with a weather-tight, and often translucent, envelope. Leisure buildings require large open spaces without the interruption of columns and other elements. Accordingly, column positions are carefully located to suit the functional layout of the structure. In this respect, most stadia, grandstands and large indoor sports arenas adopt a grid system whereby frames are set out in a standard pattern. This allows regular spaces for other facilities such as the hospitality areas, restaurants, changing rooms, etc. Additionally, it allows repetition in the design which can lower the building costs. The dimensions of the grid are optimised depending on the structure and other issues such as seat widths and minimum distance requirements between exits. Typical grid dimensions are in the range of 7 to 9m although larger grids of up to 20m are also used. A good understanding of the relative cost of different span and bay centre options is crucial to achieve an optimum layout. Good advice can be obtained from steelwork contractors specialising in leisure buildings. 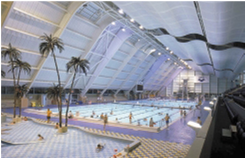 In some leisure buildings, very large spans are required, for example over swimming pools. With increasing spans, the structural cost per unit area falls gradually to a minimum at a span of around 30 to 35m. Above this span, the costs start to increase so large leisure buildings like stadia and sports arenas are usually designed using optimisation procedures and detailed computer modelling in order to achieve the most efficient design. It is usually necessary to run a number of alternative designs to identify the optimum layout for the proposed structure. A key advantage of using steel for leisure buildings is that erection can be fast, and offers the ability to be constructed largely off-site if required. The speed of erection and the need for specialist lifting equipment must be considered at the earliest possible stage of the construction process. Decisions made at this stage will have a large impact on the number of work fronts available to the erectors, so the overall layout of the building may need to be changed if a particularly rapid site programme is required. This can be important in urban areas or on sites with restricted access. 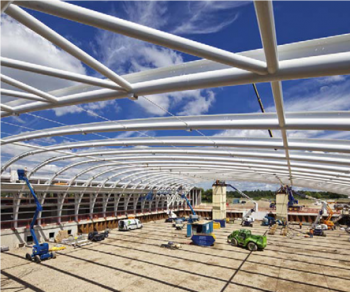 The main framing systems which are typically found in leisure buildings include long span trusses and portal frames using moment resisting connections. 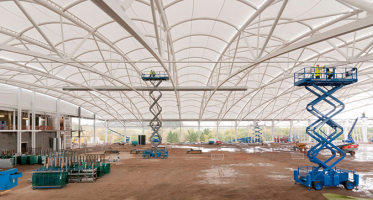 Of these systems, truss and column solutions are particularly common in leisure buildings such as stadia, indoor sports arenas, halls and theatres as they provide an efficient means of increasing the useful span. Leisure buildings that do not require long-span construction may employ simple beam-and-column frames, such as those used in single-storey buildings, educational buildings etc. Truss and column construction is an extension of the simplest framing solution, i.e. beam and column frames. A truss is a framework of members in which loads are resisted primarily by axial forces in the individual members. Trusses are commonly used in buildings to support roofs, floors and other internal components such as services and are generally more economical than standard steel I beams over relatively large spans. Resistance to lateral loading is achieved either by using rigid connections at the column to beam connections, or by designing the columns with fixed-bases. 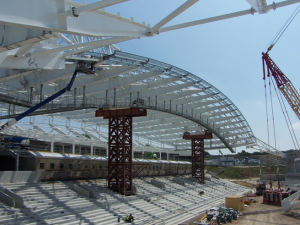 The truss and column solution provides an economic solution to long-span construction, and is often employed in large leisure structures, such as stadia. Members of lightly-loaded trusses are generally in the form of hot rolled angles as the web elements, and either angles or structural tees as the boom and rafter members, the latter facilitating ease of connection without the use of gusset plates. More heavily loaded trusses comprise Universal Beam and Column sections, hot-rolled channels and structural hollow sections, and the connections invariably employ the use of heavy gusset plates. Given the very large spans found in major stadia, circular and rectangular hollow sections are typically employed in these types of structure. The deflections in trusses are modest, making them especially suitable for long spans in stadia, as shown. 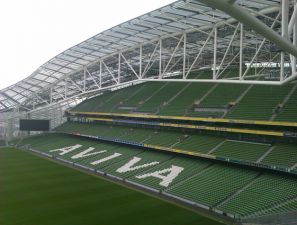 An alternative framing option for spans of 20 to 60m is the portal frame, which is particularly suitable for theatres and indoor sporting arenas with spans that are less than those required in stadia. These structures have been a very popular form of construction in the UK since they first became widely used in the 1960’s. Plastic design techniques are used to create open spaces up to about 60m economically. Ideally for leisure buildings, which require large column-free areas, portal frames provide an excellent cost-effective solution for long-span, single-storey buildings. Portal frames typically use hot rolled I-section beams and columns for the roof rafters and supporting columns, although cold formed sections may be adequate for some small span structures. Portal frames come in a variety of different shapes and sizes, with flat and pitched roofs. The schematic arrangement of a typical single storey portal frame building is shown. This is the simplest and probably the oldest form of roof bearing structure. A row of columns runs parallel to the edge of the sports area that supports an arrangement of beams or trusses. Alternatively, the columns can be placed part way between the front and rear seating. This form of roof is rarely used nowadays due to the requirement for column-free spans and unobstructed viewing. This is really a refinement of the Post and beam form except the main spanning element of the roof structure again runs parallel to the edge of the sports area but is supported at the ends only. 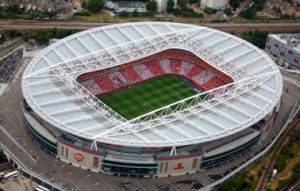 One of the most common roofing strategies in this category is to use a simple bending system comprising fabricated truss roofs, generally one-way spanning, such as at Arsenal’s Emirates Stadium. Cantilever structures are considered to be the standard solution to the challenge of providing unobstructed viewing. Structural elements are set at right angles to the edge of the pitch overhanging the seating area and linked together to form a stand roof. The roof can be supported at the back only, leaving the front free of intrusive supporting columns. Special design considerations for this form of construction include reversal of forces due to wind uplift. Cellular beams or tapered girders are typically specified for use in cantilever roofs as they are efficient in material use and visually interesting. Tensile structures are intrinsically variable and hence it is difficult to define them. They are designed to resist all loads through tension alone and so, the need to resist upward and downward forces results in highly curved shapes. There are two types of tensile roof form: cable net (where the roof material is supported by a network of cables) and structural membrane (where the roof covering material forms both the structure and the enclosure). 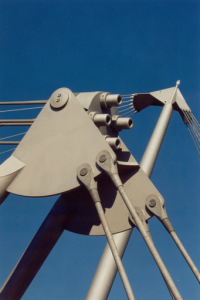 Although lighter than other options, tensile structures are technically sophisticated. 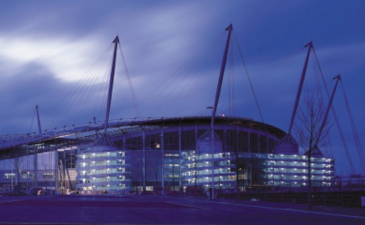 A tensile system is used at the Etihad Stadium in Manchester whereby the primary roof support structure comprises a pre-stressed mast and cable-net system which is structurally independent from the roof-plane rafters and purlins. 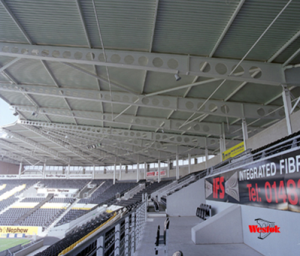 In this stadium, tensile members, such as wire ropes and bars, are provided to give intermediate support to the roof beams, thus allowing those members to be reduced in size. The stays are supported by pre-stressed masts which are then anchored or braced with other stays. This provided the added advantage of flexibility in the sequence of construction for the roof. Cable-net roofs offer an alternative lightweight option for large span roofs. The virtual elimination of all scaffolding and temporary works effectively saves on costs and provides a fast solution for some applications. If there is the opportunity to create a completely new ‘bowl’ stadium, either elliptical or circular in plan, then a 3D-roof form may be considered. Ring beams (continuous supports encircling the stadium concentrically) are integrated into the roof, giving it the appearance of being supported only at the outer edge. 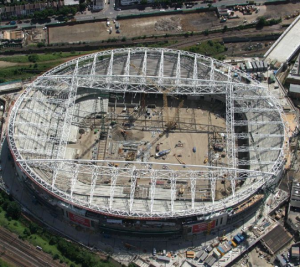 With this form of construction, the external profile can be minimised, reducing the visual impact of the stadium. One of the best examples of a ‘bowl’ design in the UK is Court No 1 at Wimbledon, as shown. Other forms of 3D structures common in covered arenas are domes (perhaps of crossed arches), grids or space frames. 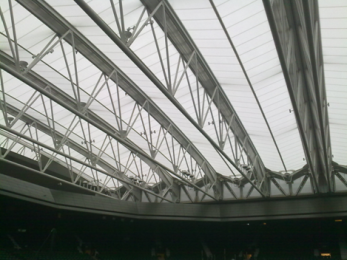 Such designs can permit the addition of either permanent or removable/retractable roof coverings. 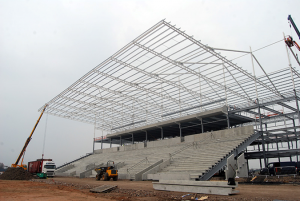 Steel plays a vital supporting role in all of these categories of stadium roof. It facilitates the wide spans required, and when correctly protected, requires little maintenance. With lightweight structures, using steel with cables and membranes, translucent roofs allow a lot of light to penetrate, reduce the artificial light requirement and provide better conditions for television coverage. As stated before, in some cases stadia utilise different roofing strategies within the one complex. 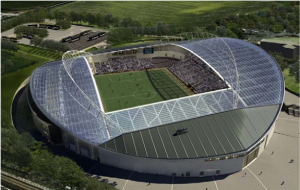 For example, the new Rotherham United football stadium consists of four inter-linked, but structurally separate stands. 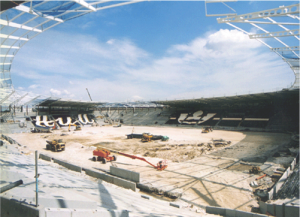 Covering two of the stands (west and east) are cantilever roofs formed with cellular rafters, while the two end stands (north and south) have roofs supported and stabilised with 4m high masts and connecting backstays. It is noteworthy also that some modern stadia have adopted retractable roofs so that play need not be disturbed by the weather. 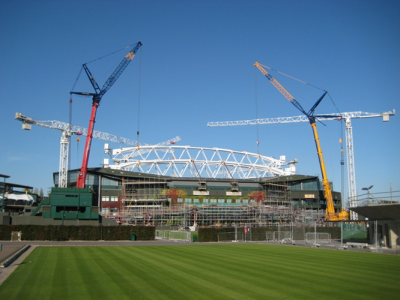 Steel offers a choice of solutions, one of which is employed at Centre Court at the All England Lawn Tennis Club (Wimbledon). The steel solution chosen comprises ten roof trusses which span 77m across the court and support the tensile, durable Tenara fabric. The roof opens and closes in the form of a ‘concertina’ across the span of the ceiling. 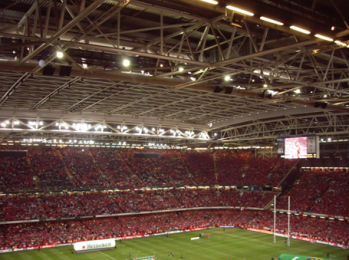 Another UK example is the Millennium Stadium in Cardiff which, at the time of its construction in 1999, was the largest spanning retractable roof anywhere in the world. This roof is suspended from four 93m high steel pylons braced with tensioned steel cables. The pylons support two 220m long primary trusses with each of the sliding roof sections composed of five lateral trusses spanning between the main trusses. In leisure buildings, to accommodate spectators, seating arrangements and particularly sightlines, are key design criteria. Spectators must be able to see over the people in front of them and their view should be unimpaired by structural elements, e.g. columns. Steel offers the ideal solution as roofs can be constructed using trusses and cantilevers, so columns are not necessary. The angle of a stand is known as a rake and consequently, the steel members used to support the seating in a stand are known as rakers. The rake that is selected for a particular application is directly dependent on the sightline, which is a term that refers to the ability of a spectator to see a pre-determined focal point, e.g. on the pitch, over the top of the heads of spectators immediately in front, and is typically referred to as ‘C’ (see figure). The value of ‘C’ may vary from sport to sport and hence the angle and design of the rakers is sport-specific. For example, the measurement of ‘C’ may be relatively large for horseracing venues in order to take account of spectators wearing hats. More guidance on ‘C’ values is available in the UK Guide to Safety at Sports Grounds. This recommends that the angle of the rakers should be no more than 34° without special measures being provided, e.g. handrails in front of seats. Generally, for new theatres, a lower angle of seating is employed than that used for stadia. Designers may choose to vary the slope of the seat back depending on the location within the auditorium, e.g. more inclined in the stalls to and give a direct sightline to the stage whereas the backs of circle and gallery seats may be steeper. This type of strategy is more commonly found in theatres than sporting arenas as the area of interest, i.e. the stage, is more focussed. The design of modern stadia with raked seating creates large volumes of enclosed space under the stands. Modern stadia utilise a large proportion of this space to accommodate other revenue-earning facilities such as hospitality boxes, meeting rooms, shops, restaurants and bars as well as fitness rooms and changing facilities, etc. Fire safety and ease of evacuation are key issues for these facilities. Leisure buildings are often designed to be unique and are therefore often motivated by architectural requirements. In addition to this, they are typically large in scale and often built in relatively confined urban sites where space is often at a premium. This, coupled with the inherent requirement for long spans, mean the steel is traditionally the most suitable material for leisure buildings. Steel also provides a cost-efficient solution when the exposed steelwork is employed as an architectural feature. For stadia, the most critical design decision relating to the structural form centres around the form of roof that is employed. On the other hand, for arenas and indoor theatres, auditoria, etc., the design of the building has to be coordinated with its functional requirements and its operational energy performance, including lighting, acoustics, etc. A comparison of the benefits and the reasons for choosing a particular building form is shown in the table, for the most commonly employed forms of construction in the leisure sector, i.e. simple construction, portal frame or truss). Can be uneconomic if serviceability governs the floor design . . Continuous frames are those in which resistance to lateral forces is provided through a combination of member stiffness and joint stiffness and therefore bracing is not required. The most common form of continuous frame is a portal frame, which is often used for single-storey buildings. Other types of continuous frame do exist such as rectilinear beam and column frames although these are less efficient than portal frames. These are the most commonly used type of structural frame for medium-span leisure buildings, whereby the resistance to lateral forces is provided through member stiffness and enhanced connections in the form of haunches. Steel portal frames are widely used because they combine structural efficiency with functional application for enclosed spaces. Various configurations of portal frames can be designed using the same structural concept as shown in the figure. Multi-bay frames can also be designed, using either single or pairs of internal columns. For single-storey leisure buildings, braced frames can be used and may in fact offer a more economically efficient alternative to a portal frame in some situations. 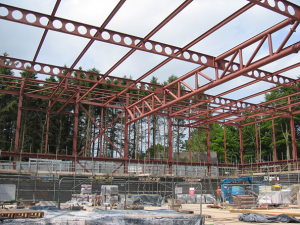 On the other hand, for multi-storey buildings, such as those which may be used for gymnasia, theatres, etc., braced frames are the most common form of construction in the UK. Where cross-bracing cannot be accommodated on the longitudinal sides of the buildings, it may be replaced by bracing in the form of stability portals. Where stiffness (serviceability) governs design, there may be benefits in considering continuous construction to reduce deflections. It is recommended that alternative schemes are developed, discussed with the steelwork contractor and costed before the final choice is made. These are common in all types of leisure buildings due to the general requirement for large, open and uninterrupted spaces. Many forms of beam are suitable for spanning long distances, although the type of beam selected should depend on the distance it is required to span, according to the information given in the table below. The most common forms of long span beam found in leisure buildings are trusses and cellular beams, although deep tapered girders are also used, particularly for cantilever roofs. All of these beam types can both be specified as straight or curved member, depending on the architectural requirements. The benefits offered by any particular solution must be compared with the layout and drivers for a given project, so that the most appropriate and cost-effective solution can be identified. The design of long-span steel and composite beams is generally carried out in accordance with BS EN 1993 and BS EN 1994. An important design issue for all long-span beams may be dynamic performance. Trusses are one of the most common types of structure found in leisure buildings. They comprise an efficient arrangement of slender members and are generally more economical than standard rolled steel beams over relatively large spans. Accordingly, they are an ideal solution for large leisure buildings, such as stadia, as they are also considered to be an architectural feature of these structures and are fast to erect. 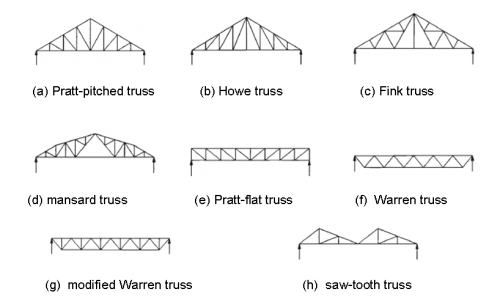 There are many types of truss; some of the most widely used are illustrated here. The type of truss that is adopted is usually governed by architectural and client requirements, in addition to geometric and economic factors. Trusses can offer efficient structural solutions in terms of material use, particularly where large spans are required. However, it is noted that any potential savings to the overall steel weight by using a greater number of relatively small members may increase fabrication costs. In general, simple design with maximum repetition is preferred. The designer should also consider practical construction issues, e.g. the transportation of elements to site and the erection plant and machinery which will be employed, as these may dictate the design of the truss. The type of truss that is selected is dependent on the particular application and the applied loads. Pitched-roof trusses can have a span-to-depth ratio at the apex is between 4 and 5, with a span range of 6m to 12m. For spans of between 15m and 30 m which are commonly found in leisure buildings, the mansard truss offers an economically-efficient structural solution for span to depth ratios of about 7 or 8. It also reduces the unusable roof space whilst retaining the pitched appearance. Parallel chord trusses, i.e. lattice girders, have an economic span range of between 6m and 50m, with a span-to-depth ratio of 15 to 25 depending on the intensity of the applied loads. For the top end of the span range, the bay width should be such that the web members are inclined at approximately 50° or slightly steeper. For long, deep trusses, the bay widths become too large and are often sub-divided with secondary web members. The most economical spacing between roof trusses is a function of the overall span and load intensity as well as the span and spacing of the secondary transverse roof members, i.e. purlins. However, as a general rule, the spacing of frames should be between 20 and 25% of the span, which results in a spacing of between 4m and 10m for the most cost effective span range. Cellular beams are manufactured with multiple regular openings and are typically used for long-spans such as in leisure buildings. These beams are fabricated by cutting and re-welding I or H profiles in a circular wave form. Alternatively, such beams may be fabricated as plate girders. Cellular beams are often asymmetric in cross-section by re-welding different sized beams or plates, which lead to optimum performance in composite design. Although fabrication costs are higher than for universal beams, it is possible to optimise both the top and bottom flanges and the web. Cellular beams can offer the opportunity for service integration with regular openings of up to 70% of the beam depth. Optimise the aesthetic appeal of the structure. Curved members are defined as having significant curvature, i.e. greater than that which arises from precambering. The types of sections that are typically curved include I sections (beams and columns) and structural hollow sections. With modern equipment, specialist contractors are able to curve steel members both accurately and economically. Curved steel structures are often designed to provide the users of the structure with natural light and a sense of spaciousness and grandeur in public facilities, such as auditoria and theatres. Rolled steel sections are usually curved by a process using cold rolling or an induction bending process. The induction process is generally more expensive than the cold process, although smaller radii can be achieved and lighter sections can be curved. The different processes produce different finishes, depending on the member, the material and the radius. Structural designers are advised to contact the specialist companies that offer these processes for project-specific advice. Composite construction is a popular choice for some leisure buildings such as gymnasia and theatres as it combines high load capacity with speed of construction to offer an economic solution for a wide range of building types. Composite slabs and beams are commonly used to provide stiff and robust floors. Composite slabs consist of profiled steel decking with an in-situ reinforced concrete topping. The decking not only acts as permanent formwork to the concrete, but also provides sufficient shear bond with the concrete so that, when the concrete has gained strength, the two materials act together compositely. Composite beams are normally hot-rolled or fabricated steel sections that act compositely with the floor slab. The composite interaction is achieved by welding the shear connectors to the top flange of the beam. Improved stiffness to reduce vibrations. Composite beam and slab construction is typically used for spans up to around 12m. For longer spans (around 12 to 18m) composite beams with web openings are widely used. Above 18m spans, composite beams with web openings would remain the preferred method of construction but beam proportions will become driven by serviceability criteria (deflection) rather than strength. SCI P359 gives detailed guidance on composite design in accordance with BS EN 1994. 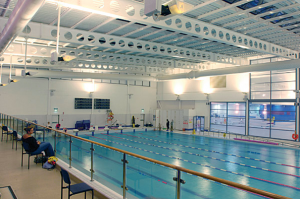 It is usually necessary for enclosed leisure buildings, such as leisure centres, sports halls, gymnasia, swimming pools and theatres, to provide a controlled, airtight internal environment that is protected from the external climate. In these cases, the required internal environment determines the specific requirements of the building envelope. Regulatory requirements under Part L of the Building Regulations are also forcing significant attention on the thermal performance of building envelopes of these enclosed spaces. A wide range of cladding solutions may be used with steel framed buildings, depending on aesthetics, cost, and durability. Generating and maintaining a controlled internal environment is a complex process, requiring a combination of mechanical and electrical services to heat and/or cool the building and a well-designed building envelope to regulate heat gains and losses. The building envelope is important for the thermal performance of the building, for acoustic insulation to external noise, to prevent the spread of fire and to provide ventilation to the building. Furthermore, the envelope may have an important role to play in the structural performance of the building, by providing restraint to the secondary steelwork. Where such restraint is assumed (as is often the case in the purlin and side-rail load/span tables provided by manufacturers), it is essential that the cladding is capable of providing this restraint in practice. Steel is a light and strong material which can be used in conjunction with a wide range of cladding materials. However, the designer should also give due consideration to how a building will deform under load when selecting the cladding system. 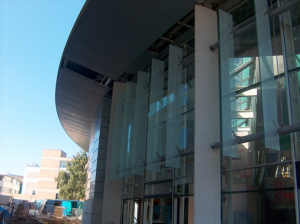 Some types of cladding, such as glazing which is commonly found in leisure structures, are brittle and problems may arise if brittle cladding is fixed to flexible parts of the supporting structure via rigid connections. Given that long span beams are widely usual in leisure buildings, deflections of up to 50mm are expected under design loads and this should be considered and incorporated during the design of the cladding system. Brickwork is another common form of cladding that is employed in leisure structures and consideration should be given to how the heavy loads arising from brickwork will affect the steel frame. Stainless steel pins and ties. The construction issues associated with leisure buildings tend to differ from building to building. The following sections briefly describe some of the main issues which arise in the design of leisure buildings using steel construction. The construction of new leisure facilities and the refurbishment of older venues are generally high budget projects, which require major initial investment. Therefore, it is essential that the planning and construction stages are kept as short as possible to achieve an early return on investment. With many sports having a ‘closed’ part of the season or year, or important annual events, speed of construction is often critical and is often organised within one year. 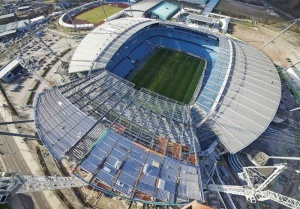 In order to complete projects successfully, both in terms of time and money, effective communication of the complete design intent to the construction team is vital, particularly for more complex projects like large stadia. The specifications given to contractor should be concise and clear and their understanding of the design should be checked for compliance by careful review of the method statements. Careful consideration of the procurement route should result in efficient organisation of subcontractors on site, which will minimise subsequent delays. The key sustainability issues vary significantly depending upon the type of leisure building. For example, issues involving large stadia relate mainly to the location of the building both in terms of transport links, and their integration within and stimulation of, the local area and economy. From a structural view, issues relating to the efficiency of the structure and the ability to extend and deconstruct it in the future are further important sustainability aspects. For indoor sports venues such as health clubs, leisure centres, swimming pools, etc. water and energy use are key sustainability drivers. Operational energy efficiency including measures to reduce energy consumption and to generate renewable energy. Use of natural lighting where appropriate to supplement artificial lighting. Although it should be noted that many sports have strict requirements for lighting levels and therefore natural daylighting needs to be properly designed and controlled to be effective. The form of construction that is selected for a given leisure project is entirely dependent on the specific requirements of that project. As leisure buildings are typically large in scale, they often benefit from a customized design rather than more generic solutions. Key design criteria for sports buildings and spatial requirements for a large range of activities are published by the national sports councils and by the main governing bodies for the individual sports. Typical internal design criteria which must be addressed include crowd circulation, minimum and maximum temperature, relative humidity, ventilation, lighting levels and noise rating. Each of these criteria varies depending on whether the space is utilised as a gymnasium, office, swimming pool, restaurant, circulation area, changing area, etc. Structures which attract large crowds during normal usage, such as stadia, must be designed in order to facilitate easy and safe circulation of people around the venue. To this end, the large volumes that result from using steel construction naturally lend themselves to enabling wide and spacious access and egress. Many fully-enclosed leisure buildings have an opportunity to create a controlled climate for the benefit of users and spectators. Indeed some sports like ice-skating and indoor track cycling have specific temperature and humidity requirements which require close control. This means using heating, cooling and ventilation systems, often located within the roof structure. 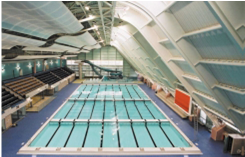 Long-span roofs involving trusses or other deep members such as cellular beams are ideal for ‘hiding’ the plant associated with climate control systems in the roof structure, as in the Manchester Aquatic Centre. The building is 45m high and the main slope starts at 40m at the top widening to 100m at the bottom. The area covered by snow is 10200m2; this equates to around 1632 tonnes of snow, based on a snow depth of 40cm. The indoor air temperature is maintained at a steady –1.5°C. 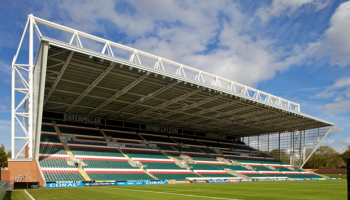 Noise levels generated in leisure buildings, whether it is a stadium, arena or theatre, may be considerable and a potential issue for local residents as well as a discomfort for those within the building. On the other hand, for stadia and arenas in particular, clients are aware that there is an optimum level of ‘noise’ in order to create a good atmosphere for all those paying to attend whose expectations in terms of good sound quality and comfort have increased in recent years. Accordingly, acoustics are an important factor in the design of leisure buildings and require careful consideration during the design stage. Steel-based solutions can be used to provide excellent acoustic insulation. For example, most cinemas use tall light steel walls with multiple layers of plasterboard to achieve very high levels of sound reduction between auditoria. Sound insulation requirements for commercial buildings, including leisure structures, are covered generically in BS 8233. The main considerations are external noise intrusion, internal noise and noise from building services. Standard acoustic requirements are not set out for theatres and auditoria specifically in a published format. For these cases, the requirements must be established on a case by case basis and agreed with the client at the specification stage of the project. It has been reported that for cinemas, which are similar to theatres in their acoustic requirements, certain leading architects and theatre operators work to a figure of Rw ≥ 74 dB airborne sound insulation between auditoria, compared with around 60 dB for normal residential applications. All structures vibrate if subjected to cyclic or sudden loading. When floors are likely to be subjected to human activities, such as those which may occur in a sports hall, there is heightened awareness of the dynamic performance of the floors. Whilst participants in an exercise class might be unaware of the vibrations that they are causing, if these transmit to adjoining rooms, they may be perceived as alarming to other building users. 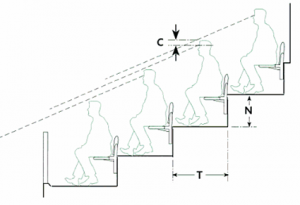 Equally, in sports stadia, where large groups of people may jump up at the same time, there is a need for designers to account for the effects of these actions on the comfort of those in attendance as well as those nearby. Leisure buildings tend to have long-spans and lightweight floor systems which inherently result in low natural frequencies and reduced natural damping. However, the greater mass of the long span sections which participate in any motion may reduce the magnitude of the vibration response. Once constructed, it is very difficult to modify an existing floor to reduce its susceptibility to vibration, as only major changes to the mass, stiffness or damping of the floor system will produce any perceptible reduction in vibration amplitudes. It is therefore important that the levels of acceptable vibration be established at the concept design stage, paying particular attention to the anticipated usage of the floors. For steel-framed building systems, there are many measures which can be adopted in order to reduce vibrations. Stiffening the structure may alter the natural frequency of a structure thereby improving the vibrations; however this is not always achievable within the architectural constraints. Isolation of the source of the vibration is another design solution. Introduce temporary or retractable props for particularly lively events. Further guidance on floor vibrations in steel-framed buildings is available in SCI P354. The Steel Construction: Floor Vibration publication is also relevant, and a useful web-based Floor response calculator is also available to swiftly evaluate the vibration response of floors. Provision for fire precautions in buildings in England is included in Part B of Schedule 1 of the Building Regulations 2000. A Government published document, Approved Document B, explains one way in which these regulations can be interpreted. Similar documents are produced for Wales, Scotland and Northern Ireland. Leisure buildings are classified as Assembly and Recreation and the minimum periods of fire resistance required for structuture, compartmentation etc. are given in the following table. It is important that fire safety of large public spaces is considered in the early stages of the design process to avoid expensive possible problems later. The fire resistance of the structural frame is only a small component of a fire safety strategy and should be considered in combination with other measures, such as alarm systems, smoke control systems and sprinkler systems, which make a more meaningful contribution to the safety of building occupants and loss prevention. In addition, the layout of the building must be developed with occupant evacuation and escape routes in mind; this is particularly pertinent for large leisure building and stadia, where large crowds may collect in concentrated areas such as at exits. Passive fire protection materials insulate steel members from the effects of the high temperatures that may be generated in fire. They can be divided into two types, non-reactive, of which the most common types are boards and sprays, and reactive, of which thin film intumescent coatings are the best example. Fire safety engineering can be particularly effective in large leisure buildings in demonstrating that the guidance in publications such as the Approved Document B can be varied and more economic and efficient solutions for the provision of fire safety can be provided. When considering corrosion protection for leisure buildings, it is appropriate to distinguish between regular stadia, theatres, halls, etc. and swimming pools. For the former category, the corrosion considerations/requirements are no different from other steelwork buildings. In this respect, using modern and cost-effective protective treatments, steel construction can provide a structure with a long life-span. These treatments can take the form of a combination of a spray or paint system, or galvanizing, depending on the corrosive environment and access for future maintenance. 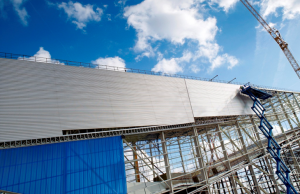 On stadium roof structures, which may be difficult to access, the designer may choose an enhanced protective costing system to increase the period between maintenance events. Swimming pools are more aggressive environments due to the high temperature, humidity and presence of chlorine in the atmosphere, so high specification coating systems are needed to provide the required durability. Leisure buildings are typically quite large and complex. The steelwork can be largely fabricated offsite in carefully controlled and monitored factory conditions, away from the congested construction site. Therefore, the on-site construction programme is reduced and the build programme is relatively unaffected by adverse weather conditions. After construction of stadia and arenas, during normal operation, the health and safety of the crowd are of paramount importance and needs to be actively considered during the design stage. Access routes and means of escape must be provided and kept clear during normal operation. In addition, for large stadia, crowd control measures can be incorporated into the design. For example, at the City of Manchester Stadium, a key feature is a ring of masts which are supported on the main pedestrian circulation ramps which are designed for crowd comfort and safety. The primary reasons for using steel framed buildings for leisure and sports buildings is their capacity to span over long distance and the use of prefabricated components which can be assembled speedily on site. The designer can significantly improve cost efficiency by having an awareness of the processes of fabrication and how these are linked to the design decisions. The achievable fit-up of components and permissible limits of tolerance should be addressed. Design must be viewed as a complete process, covering structural performance as well as production engineering, in order to achieve the most economic structures. It is increasingly important for the designer to understand the skills and techniques available from different fabricators so that the design can be tailored to keep overall costs down. The scope for reducing costs is even greater for large leisure buildings through economies of scale. The incorporation of buildability into the design phase should lead to significant additional benefits. 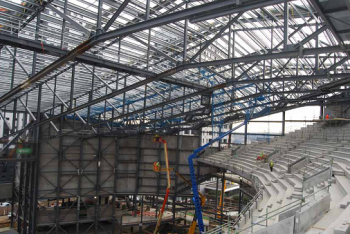 Specialist fabrication may be required for long-span trusses as 3-D assemblies are often used in stadia and enclosed sporting arenas. ↑ 1.0 1.1 Guide to Safety at Sports Grounds 'Green Guide', 6th Edition, Sports Grounds Safety Authority, 2018.